It’s fluffy, buttery and delicious….and no I’m not talking about our recent Thanksgiving meal. 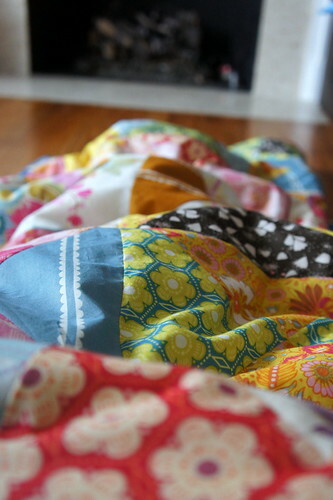 I’m talking about my FINISHED voile down comforter. Life has handed me some lemons lately and I’m slowly working at turning those into something not so sour. So I’m very proud that I was able to add this project to my finished list. To say that I’m working at a slower pace than normal would be unbelievably true. 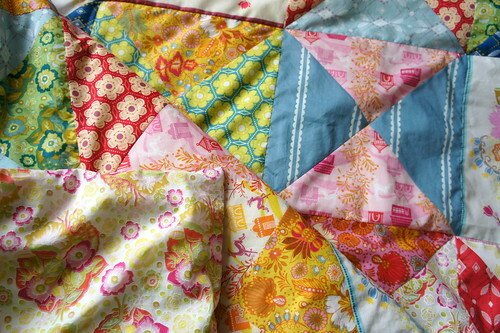 But once again, color and fabric help make the world a bit brighter. My 3 year old (4 next week!!) daughter calls this the “beautiful quilt” and I’m not about to correct that. Let’s teach them young about the magic of Anna Maria Horner’s use of color. With the exception of one print from her Innocent Crush voile line, the rest of these are from her Little Folks voile line. And they are just bursting with color! If you missed my post about piecing the top for this, you can catch up on that HERE. But then I did something a little different than your typical quilt. And perhaps it has been done dozens of times by others, but I thought of this idea about a year ago and bought a 50″ x 70″ down throw just for this project then. Essentially my goal was to use the down as the “batting” for this quilt. 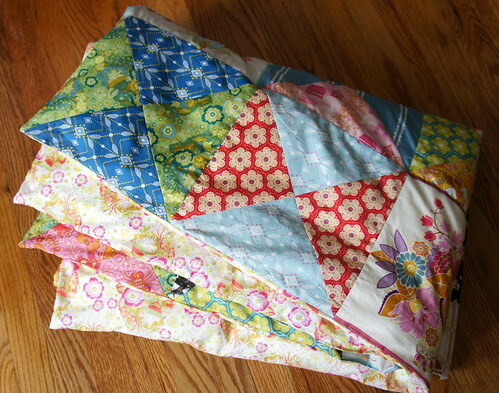 The idea evolved to create a duvet of sorts, but attach it permanently to the backing. 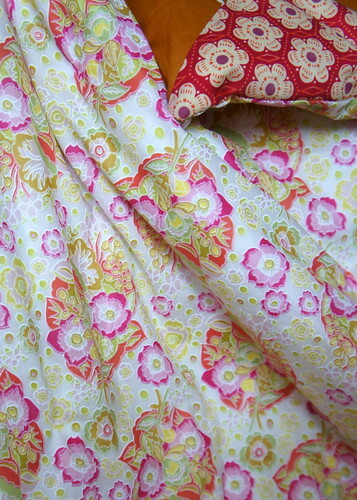 The backing is full piece of one of the voile prints, so this is a double sided voile down comforter. And I ADORE it. I sewed the top to the back, right sides together, leaving a small opening on one end. Then I inserted the down comforter as you would for any duvet and permanently sewed the opening closed. The final step was to hand tack the layers together, which I did using a perle white cotton thread at the joint of each block. When I was taking pictures of this, I really wanted to capture how light and fluffy this is. I think seeing it stacked up here gives you a good idea of how airy and soft my new favorite snuggling blanket is. With the down and voile, it is the perfect combination of warm and cool, light but dense. And 50″ x 70″ is the perfect size for me as a throw it turns out. There will be lots of snuggling by the fireplace this chilly winter with it! And this was another blanket that I just couldn’t stop taking pictures of. I know I like it a lot when the camera wants more and more photos. 😉 Can you blame it? 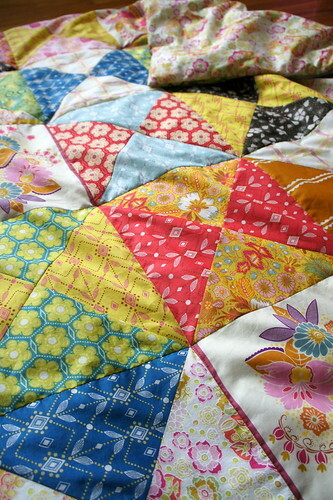 It is absolutely a beautiful quilt. I hope that you have wonderful hours snuggling under it and the lemons go away. Absolutely gorgeous! That Anna Maria Horner makes the best fabrics! To die for. Straight up luxury and gorgeousness. It looks just dreamy, Angela! Thank you! It's been dreamy! I've been snuggling with it all week. Gorgeous, what a great piece of comfort you have made! Oooh, love! Enjoy your new comforter, and I hope life gets much better soon! That is luxe through and through. Beautiful! I never intended to make something luxurious, but that is definitely what it turned out to be! Lucky me! It's fantastic. I just want to curl up in it and never come out! That's pretty much what I've been doing! The perk of those lemons I suppose is that I am getting to spend a lot of time with this piece. 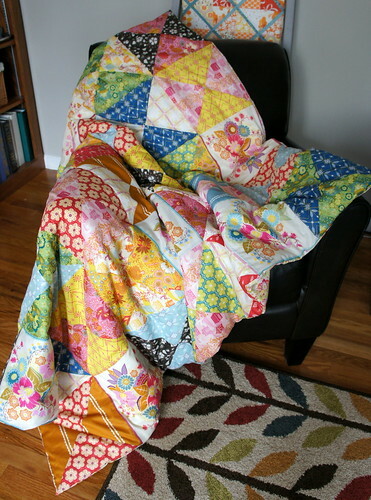 This is the perfect way to finish it, to let the patchwork float on the fluffy inside. Which reminds me, I have a down duvet somewhere…. So beautiful, and I can just imagine the perfect combination of lightness and softness the down comforter filling must bring to it! Enjoy! So pretty! It looks so soft and cozy! Love this! what a great idea to finish it in that way. It's so beautiful, Angela. I sure hope you are getting some answers about the lemons being thrown at you lately. Feel better, my friend. Makes me want to leave work and snuggle under something warm and beautiful. Here's to some lemonade. Love the idea of the down! I can almost feel it through the computer screen! I wish I actually could. 🙂 It's just gorgeous! Enjoy that bit of luxury next time you get a lemon! Oh thank you! I would definitely recommend this combo. The voile is the perfect softness with the down. OH. my. word. Down and voile. DREAMY! You are genius. You so deserve that cuddle. Be well, Angela! it is stunningly gorgeous – I just love it! gorgeous and so comfy looking! i would be paranoid to use it – i'd hate to spill on something like that!! 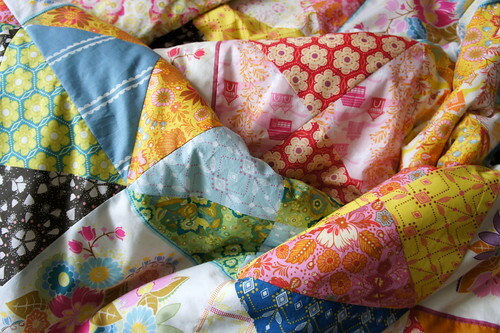 Such a colorful and beautiful quilt. And the down in the middle……pure genius! Love the down idea!–My 5 year old would love this blanket–she much prefers silky/cool blankets that are warm and toasty. Might have to steal this idea! It's like a beautiful rainbow cloud. Enjoy and take care. Te dejo un fuerte abrazo esperando que esta Navidad y Año Nuevo estén colmado de bendiciones para ti y tus seres queridos, me voy de vacaciones!!! Thank you so much! I'm enjoying every moment with this blanket!